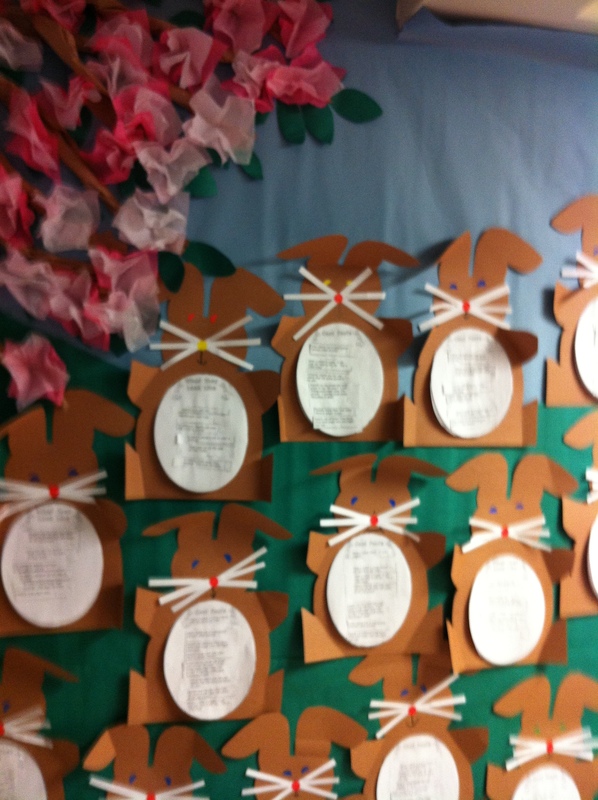 Peter Rabbit | Mrs. Anton's Class! 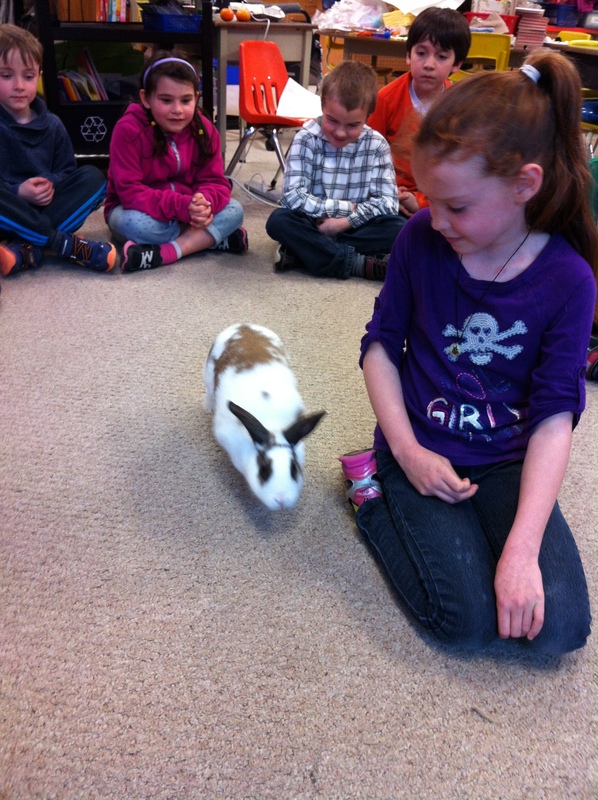 We had a great time learning about rabbits these past few weeks. 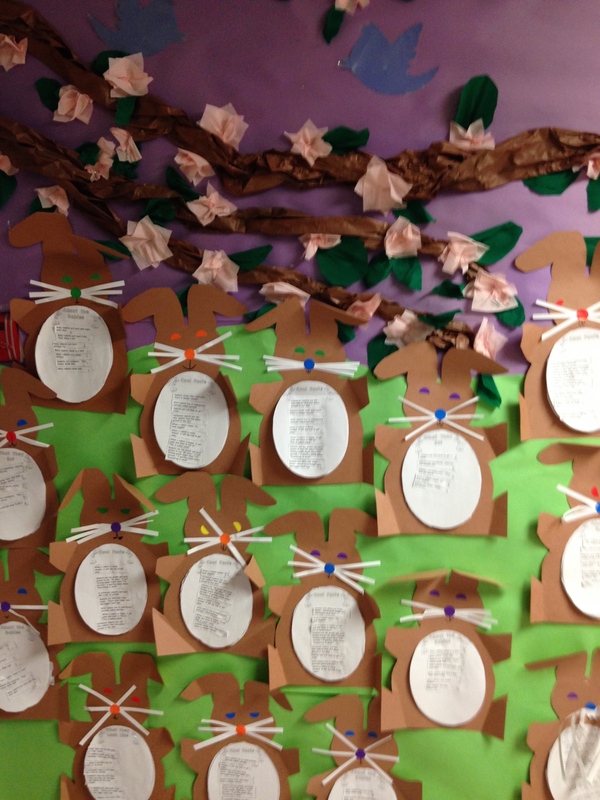 The children did a great job on their rabbit reports! We read and sorted the facts about rabbits into four different categories. The categories were What They Look Like, About the Babies, What They Eat, and Cool Facts. 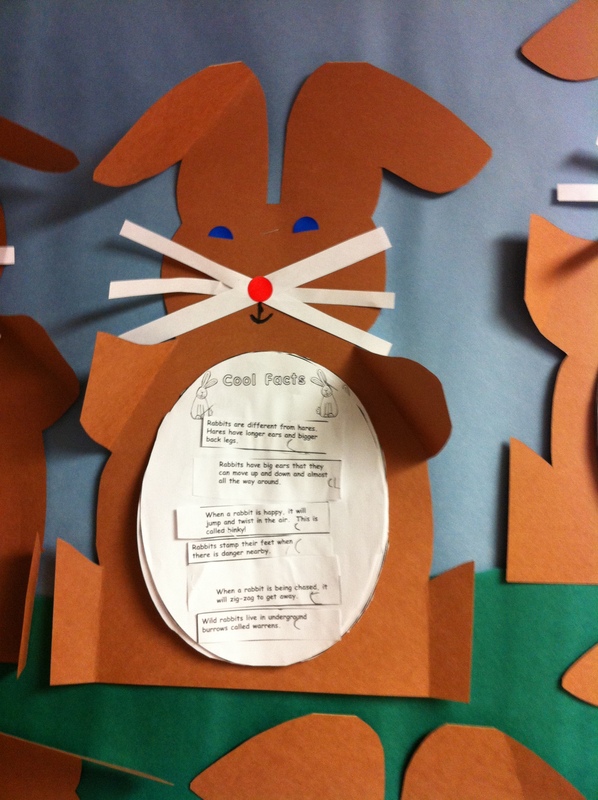 The children glued the facts onto the appropriate category page and then we turned the report into a rabbit! They did a great job! We have been having a lot of fun hearing about the adventures of our three travelling bunnies. Each night, the three bunnies travel to a different child’s house for a sleepover. Each day we share the stories that have been written about their trip. We have really enjoyed the adventures that the bunnies have had at each house! Everyone seems very excited to have the bunnies come for a sleepover. Thank you for your efforts helping to record the stories! Here are a few pictures of some of the adventures that the bunnies have had! Benjamin looks like he is really enjoying the story! He likes to play games too! Everyone seems to be really enjoying this picnic! Thanks for sending me these amazing pictures and allowing me to share them with everyone! 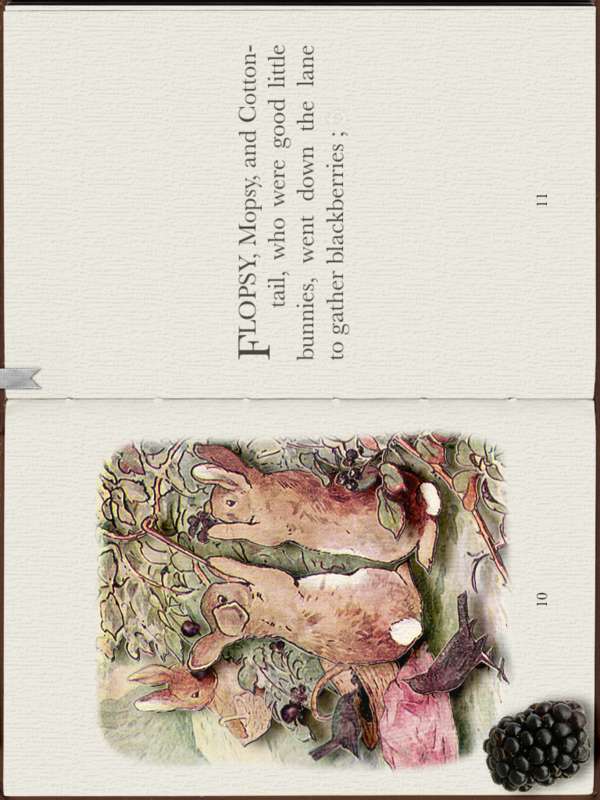 We have also been having some fun with a few Peter Rabbit apps that I have downloaded on a few of the iPads. Even Peter Rabbit has an app! I have two favorite Peter Rabbit apps. I downloaded the app from the official Peter Rabbit site and shared it with my students the first year I used the iPads. This year it was as big a hit as it has been over the past few years. You can have the story read to you or you can read it by yourself. On some of the pages you can take a shortcut to an activity page. Lots of fun! I love the coloring pages on this one! It has a special paintbrush that paints with “Beatrix Potter” colors! I also showed them the app called PopOut Peter. 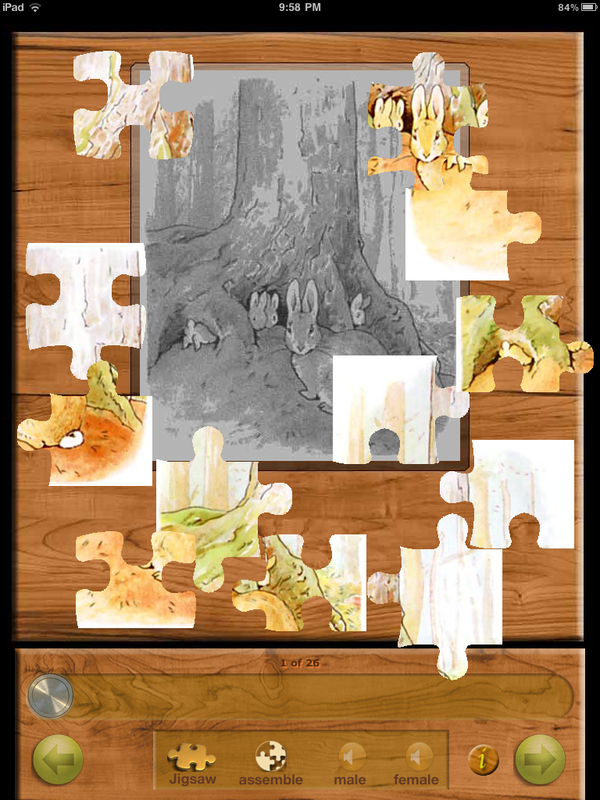 It has a jigsaw puzzle feature that I really enjoy. I think both of the apps might become favourites! We also read a favorite story by Margaret Wise Brown called Home for a Bunny! Margaret Wise Brown is one of my favorite authors. Her stories are timeless and the children always love them. 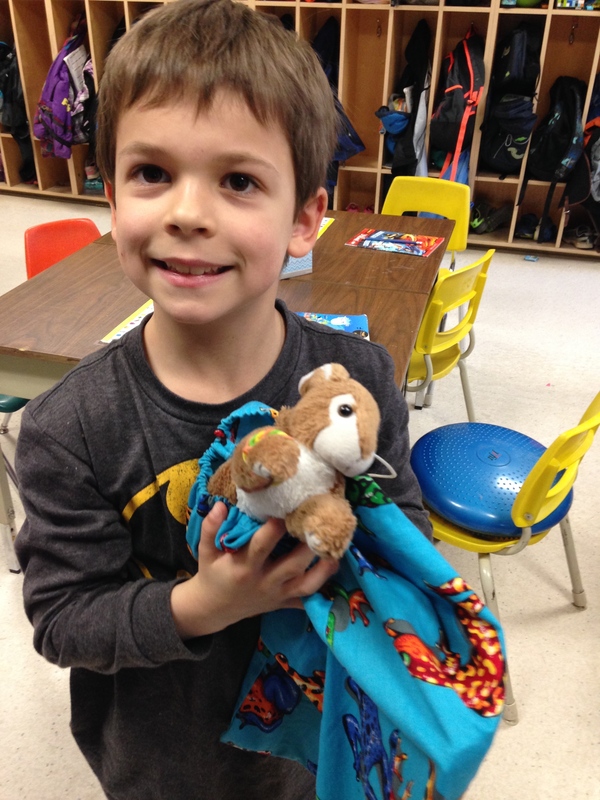 We made story maps for this story and used our BooBoo Bunnies and a paper bag puppet we made to act out the story. Hopefully they were able to share their story maps with you! 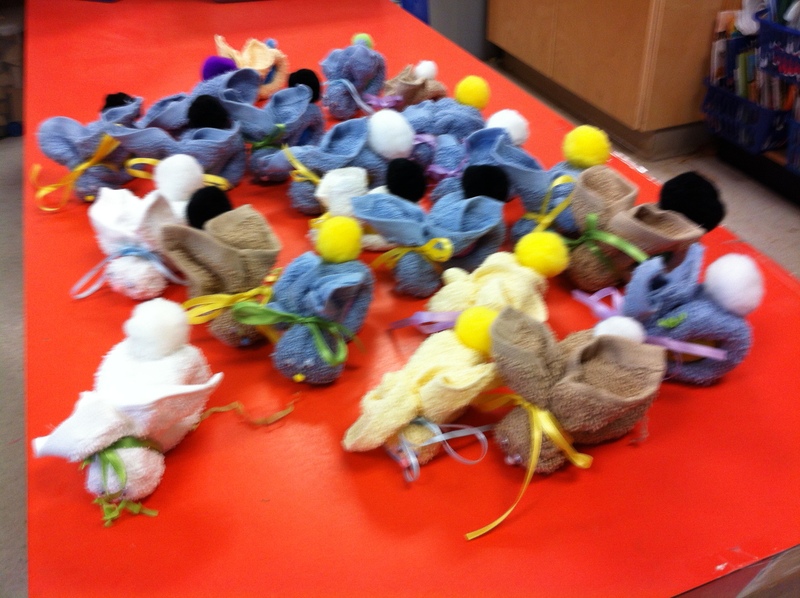 The children seemed to really enjoy the BooBoo Bunnies! Hoppity Hop! 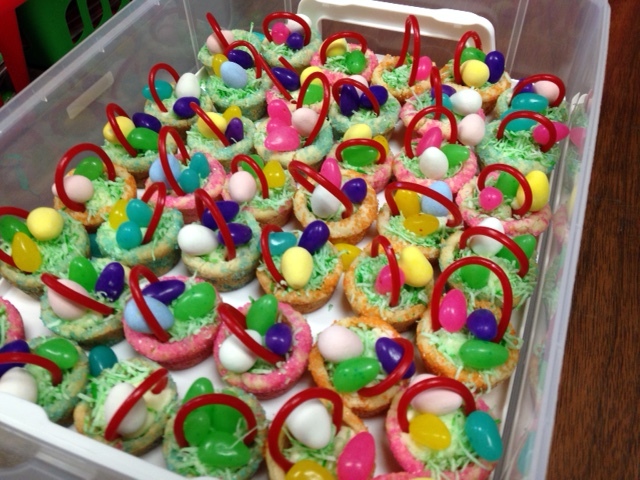 And we got to have these yummy treats! 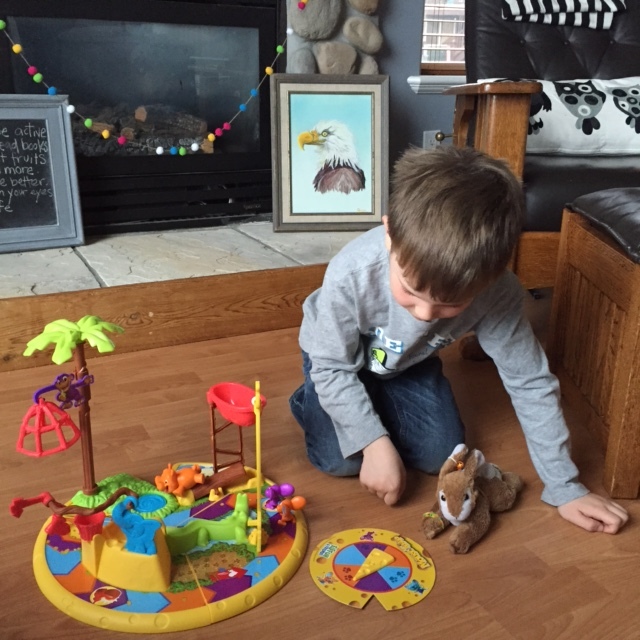 Thank you Kalem’s family! Very cute Easter baskets! 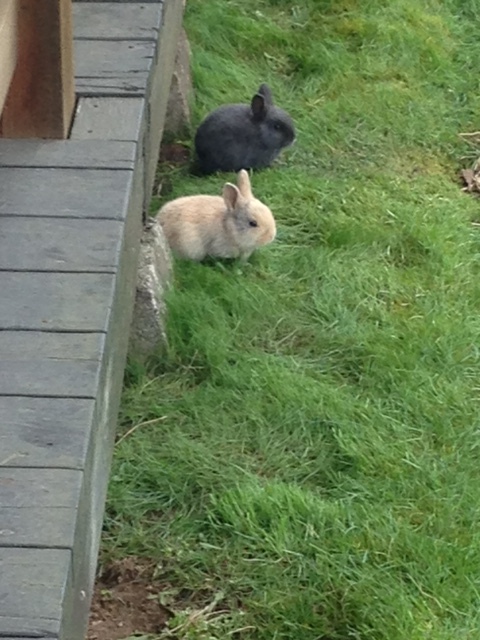 It was fun to see these cute real baby bunnies on the weekend at Coombs with my family! 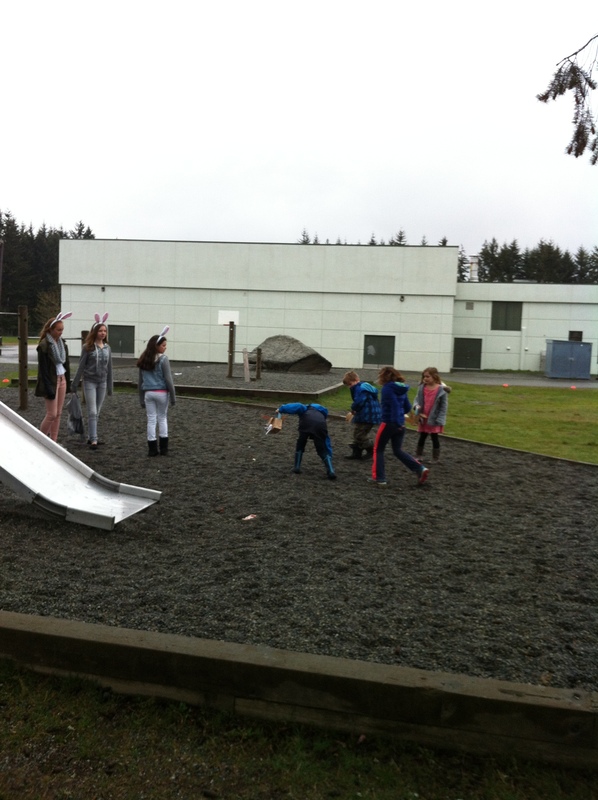 Fun with Peter Rabbit and Friends! 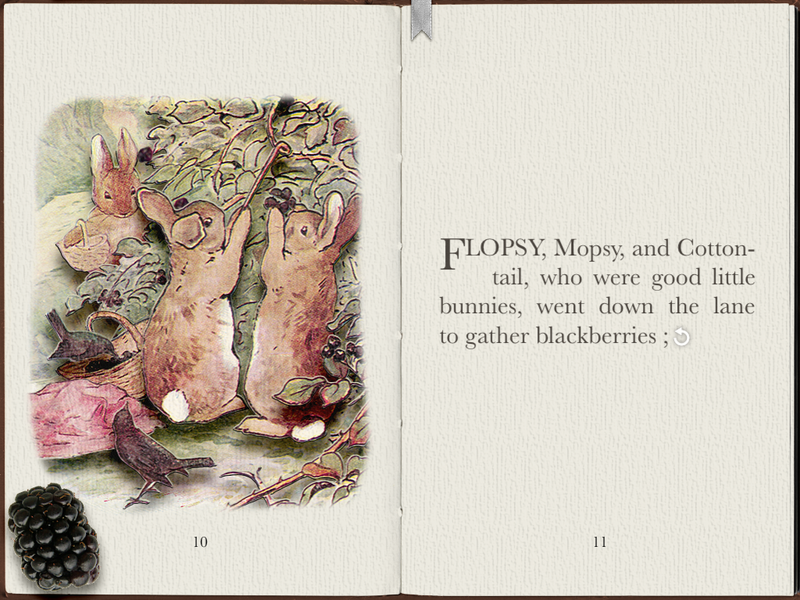 A couple of years ago I discovered that even Peter Rabbit has an app! 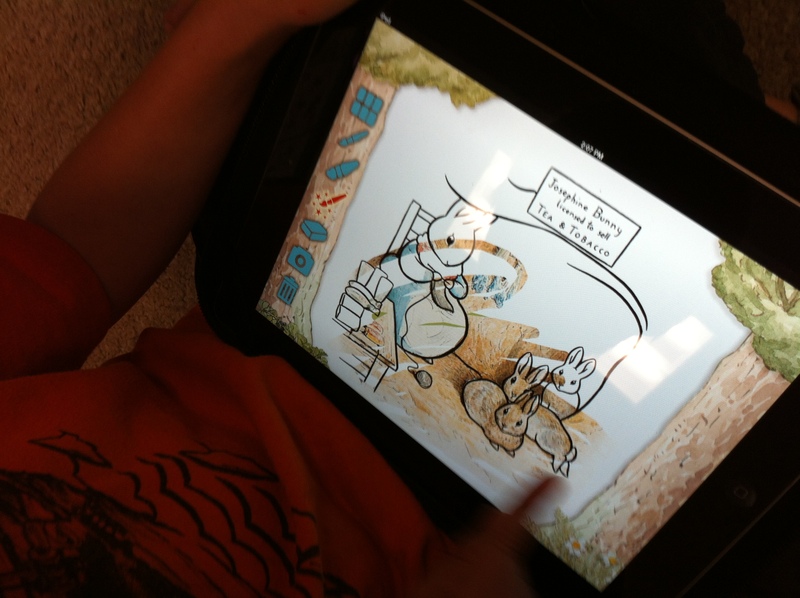 I downloaded the app from the official Peter Rabbit site and shared it with my students last year. This year it was as big a hit as it was in the last two years. The coloring pages are fun because you can use a magic paintbrush and it paints it in “Beatrix Potter” colors! You can have the story read to you or you can choose to read it yourself. There are a variety of games and activities that the children can do and all have the lovely Beatrix Potter colors and illustrations! We have been doing a lot of different things with rabbits. We did a mini research report about rabbits where the children had to read a variety of facts about rabbits and sort and categorize them into different categories! 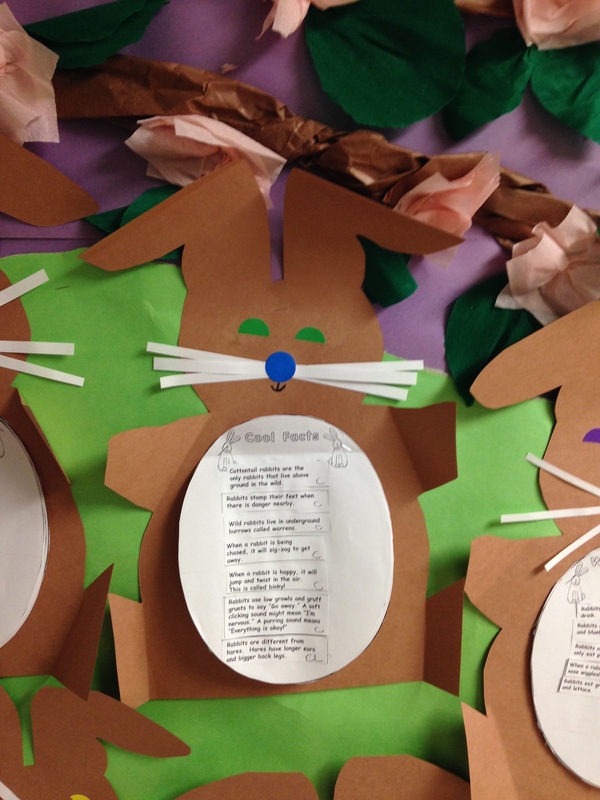 We turned it all into a rabbit shaped report! Today, we read one of my favourite stories by Margaret Wise Brown called Home for a Bunny! 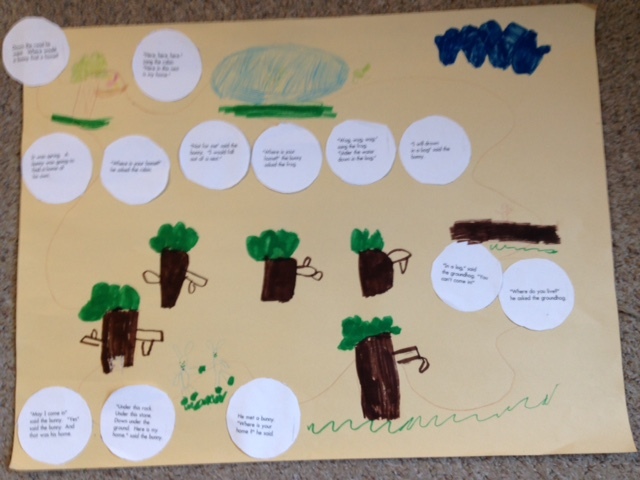 Then the children retold the story using a story map. They sequenced the story parts and had a great time illustrating their story! 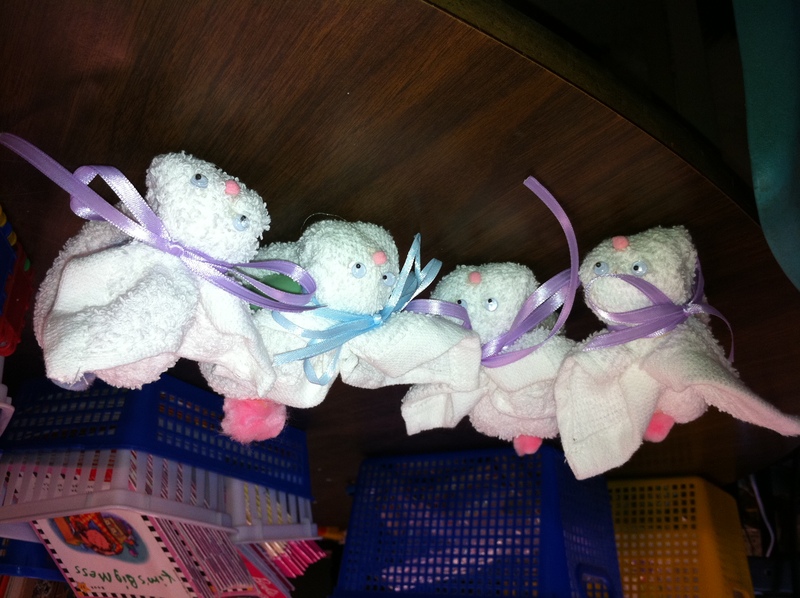 We also made some BooBoo bunnies! They will be coming home tomorrow as we didn’t quite get everyone’s bunny finished. So the bunnies are having a sleepover at school! Hope they don’t get up to too much mischief! 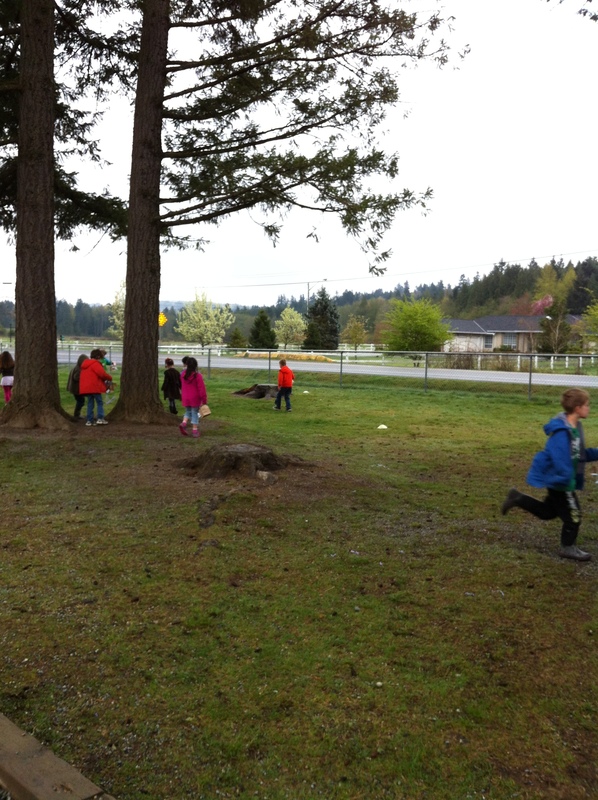 We also participated in the annual Easter Egg hunt and had to race the crows to find all the eggs. We watched one crow pick up an egg and fly away with it right in front of us! What would the Easter bunny think? We also had a real bunny called Honey Bunny come visit! What a great bunny! So gentle! 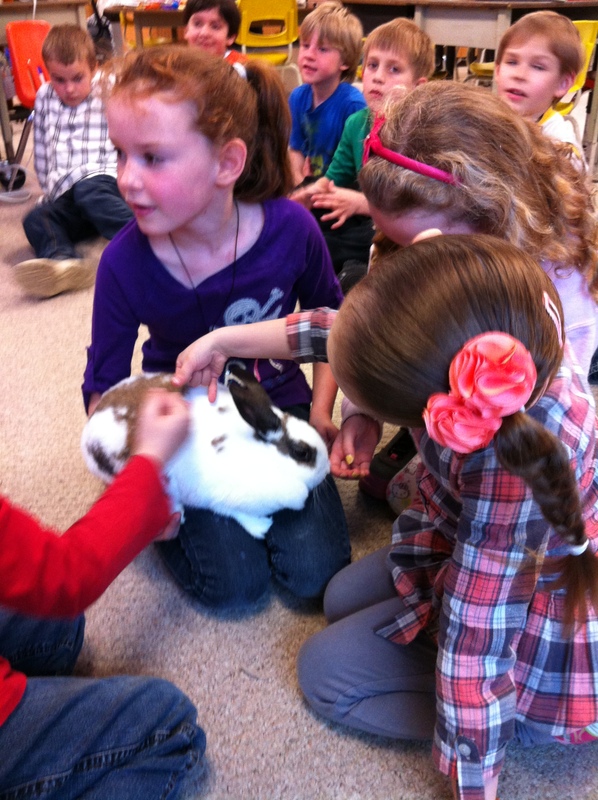 Honey Bunny hopped around the carpet visiting the children and was willing to be petted by everyone! Definitely a Honey Bunny! 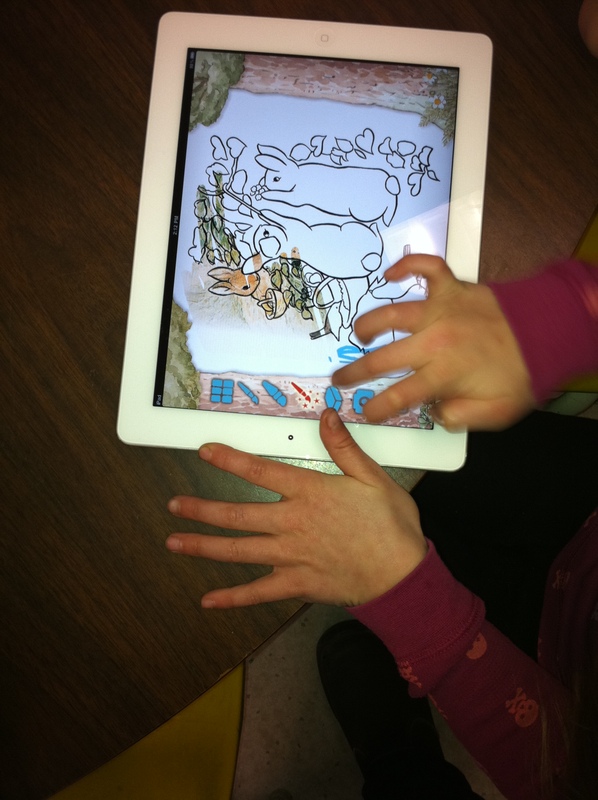 An App for Peter Rabbit! It’s Peter Rabbit time again! This year we are once again doing a mini author study on Beatrix Potter stories. I absolutely love her stories and I think that I have all of them. I have a hard time figuring out which one is my favourite! Can you guess? I have two! 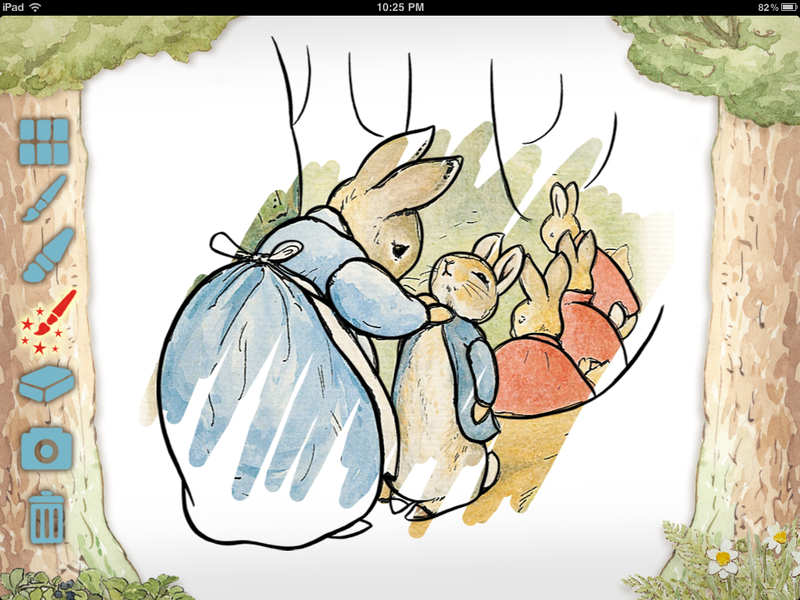 Last year I found out the Peter Rabbit has lots of apps on the iPad. 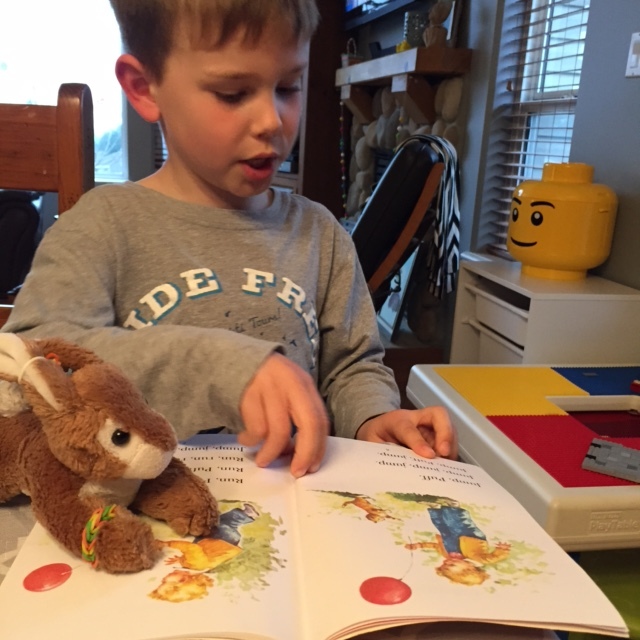 Last week, just before Easter, we read Peter Rabbit. We also watched a video I have that is really well done using the pictures in the books on Peter Rabbit and Benjamin Bunny. I wish that I had bought all the other videos in the series as they are really well done. But now I have the apps on my iPad! The ones I have are really good and the children are really enjoying them. 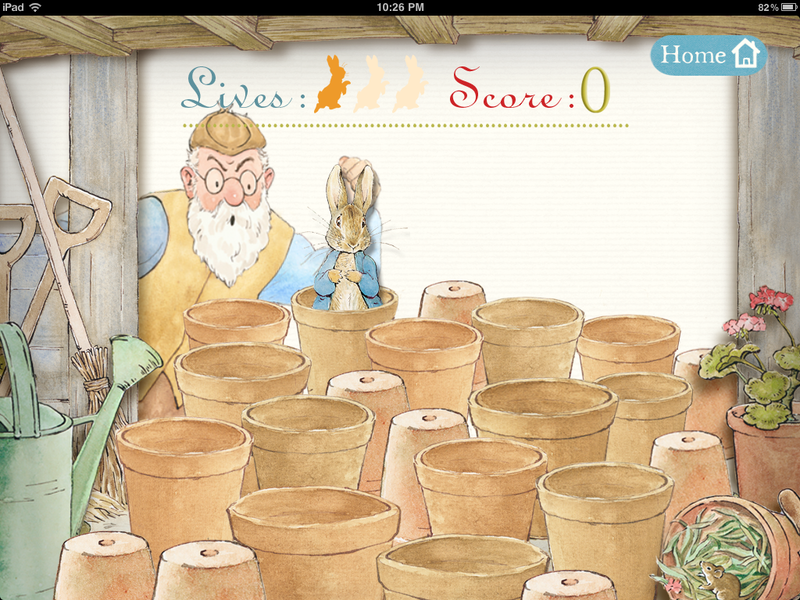 This is the Peter Rabbit app from the Official Peter Rabbit site. It has some really neat features. I have several Belkin headphone connectors so up to five children at a time can listen and use the apps at a time. They are VERY cooperative! 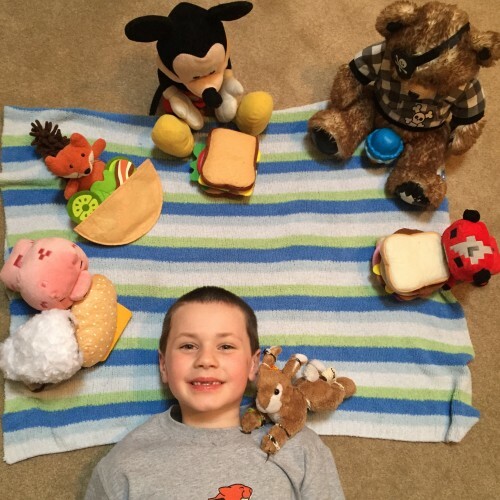 Even the stuffies enjoy reading the stories! The other app I have is called PopOutPeter! It allows you to either read the story yourself or have it read to you. It has neat little pop-ups on each page that the children enjoyed. 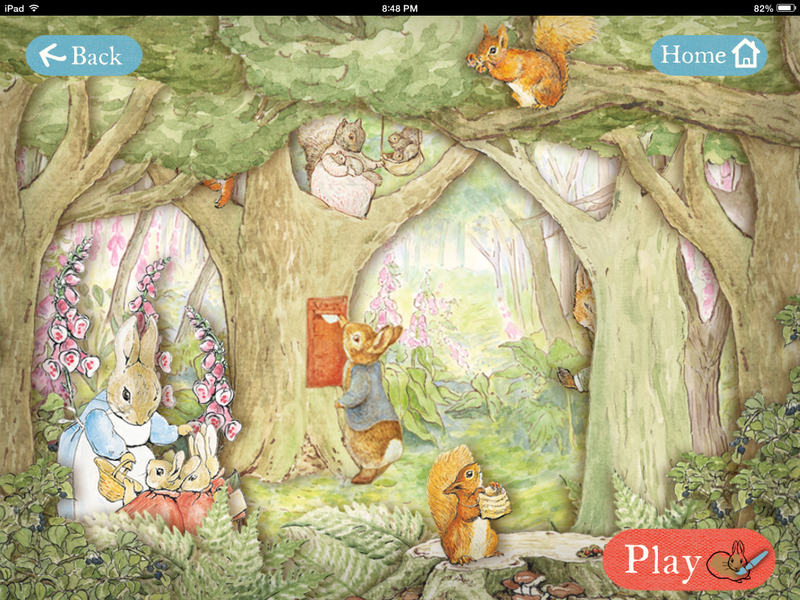 There is also another Peter Rabbit app created by iActivecom that also reads the story. 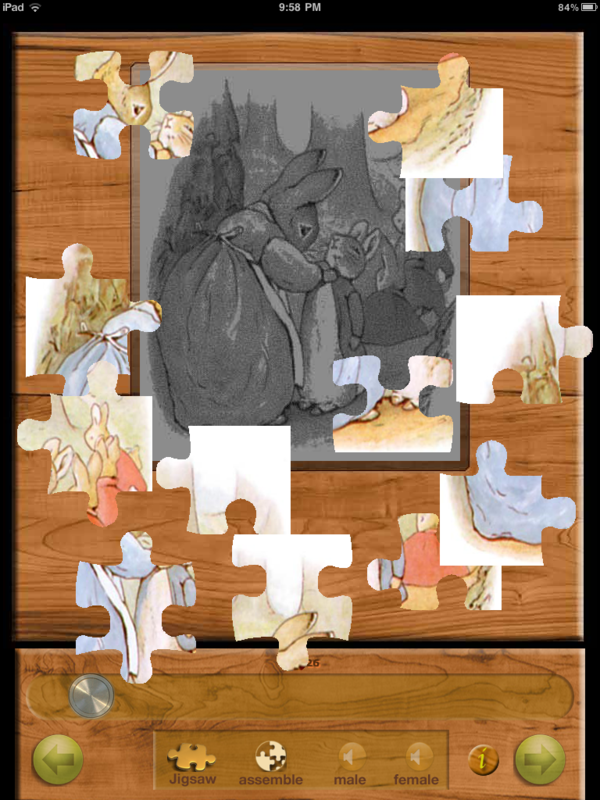 It has a neat addition in that each page can be made into a jigsaw puzzle. I love puzzles, so this one is a favourite for me! All of these apps are under five dollars. I can’t pick! I love them all! Yesterday, we read the Squirrel Nutkin story and Mrs. Tiggy Winkle. We still haven’t read one of my favourites yet! One is Peter Rabbit…. can you guess the other one? TMF! It’s Okay to Have Too Much Fun! I love to collect sayings and if you came to my house you would see them all over my house. One of my favourites is “It’s Okay to Have Too Much Fun! or TMF! Yesterday the children asked to watch the Monster at the End of this Book during storytime/eating time. As I suffer from allergies I leapt at the opportunity to save my voice and set up the story. I had the special helper of the day turn the pages as he had already gobbled up his sandwich and was eager to have the job. It was delightful to watch the engagement of the students in the story, but especially the engagement of the page turner!! 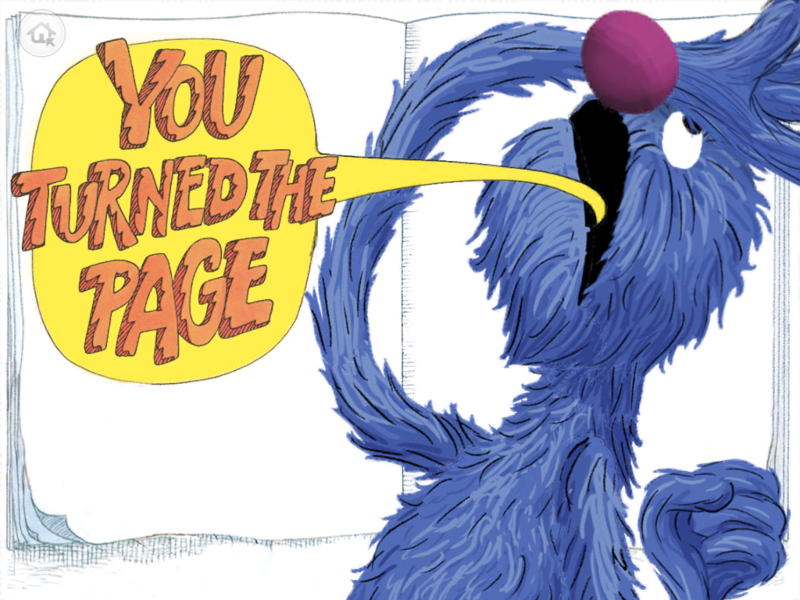 During the story, the monster pleads with the reader to not turn the page by clasping his hands together and saying “Please, please don’t turn the page!” . The student turning the pages on the iPad actually was so involved in the story that he was acting out the story as it happened complete with pleading hands! Magic! Definitely TOO MUCH FUN! Of course, then we had to listen to Another Monster at the End of this Book! Love those monsters! I have continued to bring my iPad to school each day and when the children have completed their independent projects they have the opportunity to sit at my desk on my chair two at a time working with the apps I have downloaded onto my iPad. Two other children sit on my other big chair at our classroom computer. Little people in big chairs totally wrapped up in what they are doing is definitely Too Much Fun to watch! Needless to say those chairs fill up fast. At the end of the day I shut down my iPad and shut down the apps that have been opened and I get to do a little survey to see which apps are the most popular… Really fun! The Monster at the End of this Book and Peter Rabbit are really popular which tells me that I need to find more story apps! The class WIKI is also really popular on the computer. It is neat to see what their favourite sites are. I need to find a way to let two children use the headphones… There must be a gizmo for that! We have continued to have fun with the Peter Rabbit apps. It is hard to figure out which app is the most popular. They all seem to be getting a lot of use! 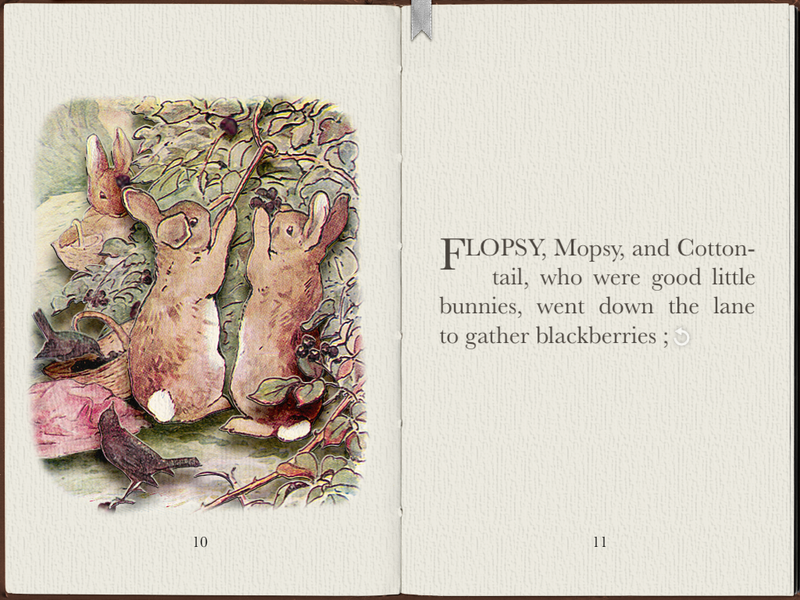 I love the coloring one in the official Peter Rabbit website app. The magic paintbrush colors the pictures in the same lovely colours that can be found in the books. 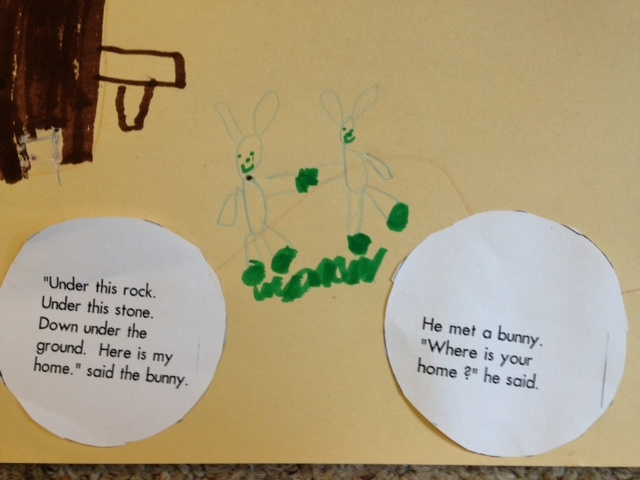 We did a story map based on the story Home for a Bunny by Margaret Wise Brown. You can’t go wrong with a Margaret Wise Brown story! 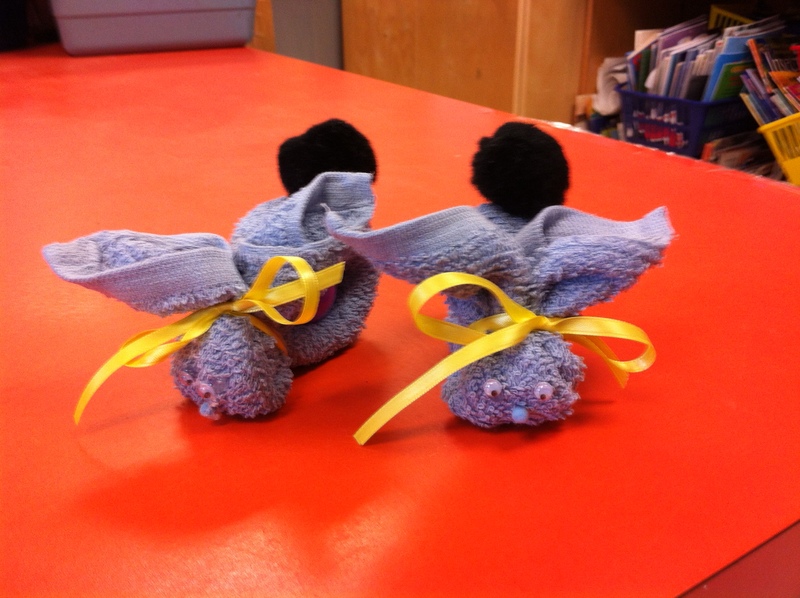 The children sequenced the story and then we made some boo-boo bunnies for them to use as a story prop to retell the stories! We didn’t manage to get them all finished on the day we did the story maps so we didn’t send them home until the next day when everyone could take their bunnies home! They were pretty popular bunnies and they had a lovely time “resting” in their Easter bunny baskets. I love the app The Monster at the End of this Book so I couldn’t resist getting the next story called Another Monster at the End of this Book. Really cute story! I used the projector to show the story using my special adaptor cord so we could all see the story on the big screen. One of the students took charge of turning the pages. Another hit! Poor Grover! He sure doesn’t like monsters! Peter Rabbit has an App! 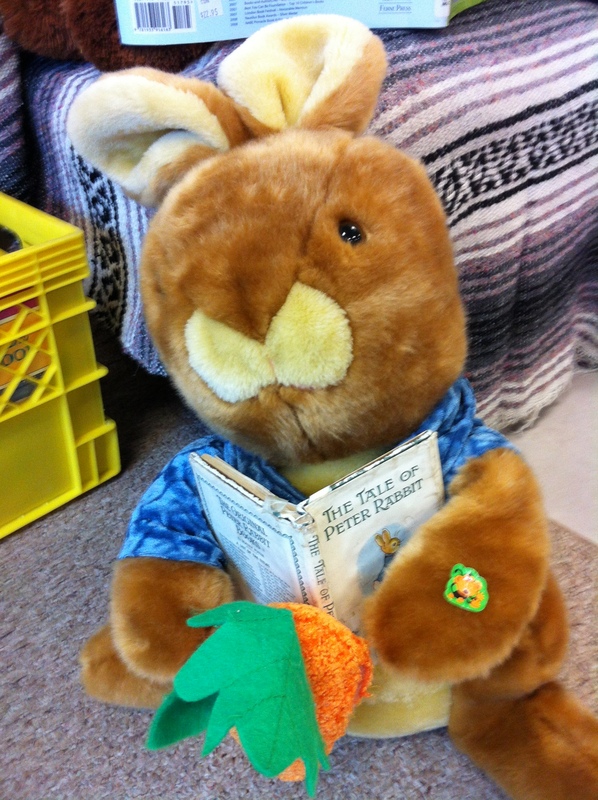 Today we continued our bunny projects with the beloved Beatrix Potter story Peter Rabbit! I am a bit of an Beatrix Potter nut. I have all the books and we have been reading some of them. I also have a really good version on video. So, of course, I went looking for Peter Rabbit apps! I found three in the short time that I went looking and we tried them all today! All were big hits! Not everyone got a chance to work with them yet but we had several children demo them on the big screen using the projector. I have a special cable that lets me show whatever is on my iPad using the projector. That makes it really easy to share with the students and I always have lots of volunteers who want to be the “demo guy”! We watched the video first today. I had already read the story previously. Then we did an sequencing activity. I chose 12 pictures from the book, and the corresponding text. The children had to sequence the pictures, find the corresponding text, and then collate it altogether into a personal little Peter Rabbit book. We also made a paper bag puppet to go with the book. 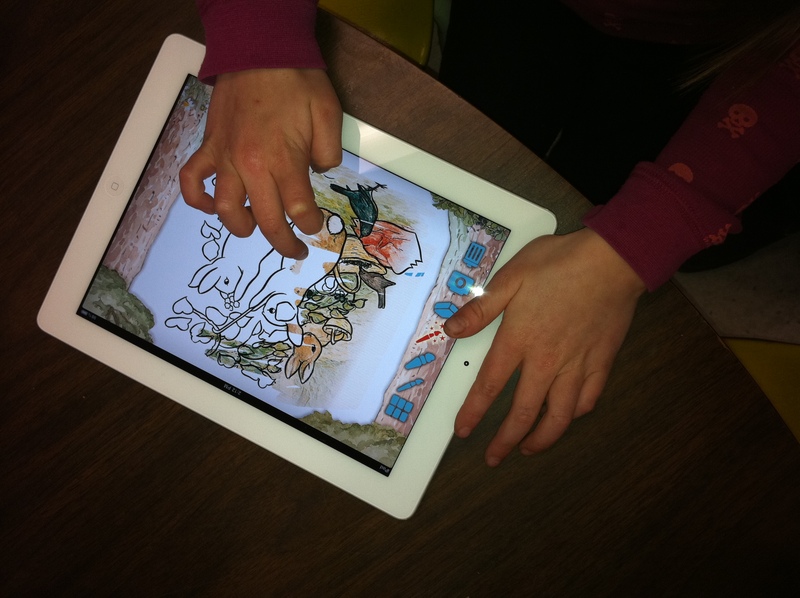 Later we worked with the story again using the three iPad apps I found. 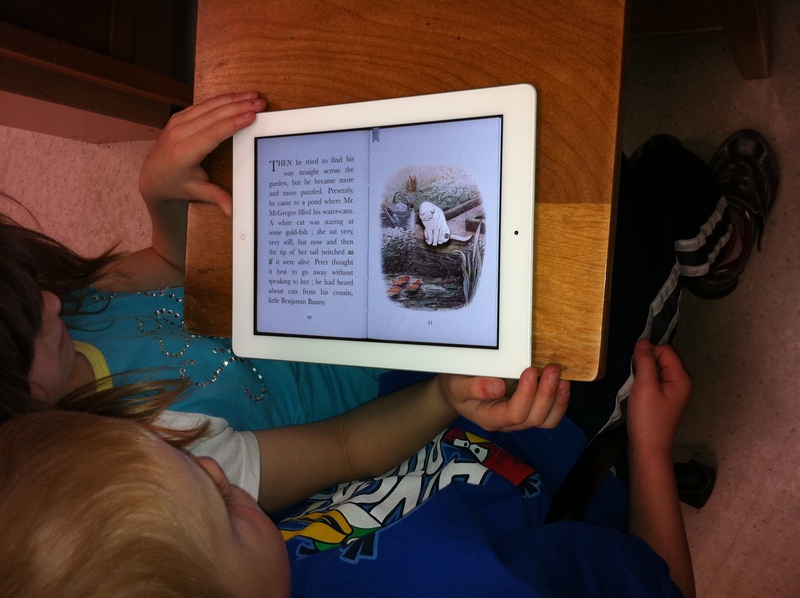 One app allows you to either read the story yourself or have it read to you. It has neat little pop-ups on each page that the children enjoyed. It is called PopOutPeter! 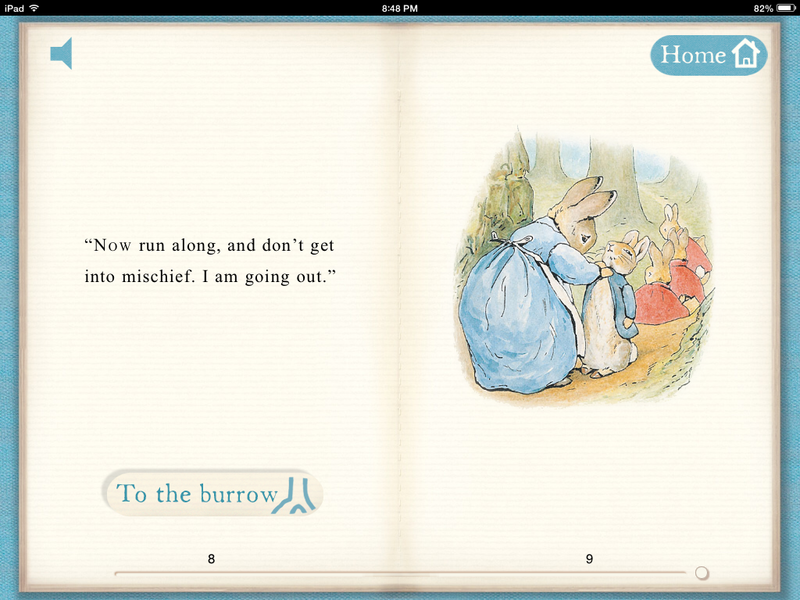 There is also another Peter Rabbit app created by iActivecom that also reads the story. It has a neat addition in that each page can be made into a jigsaw puzzle. That was fun! 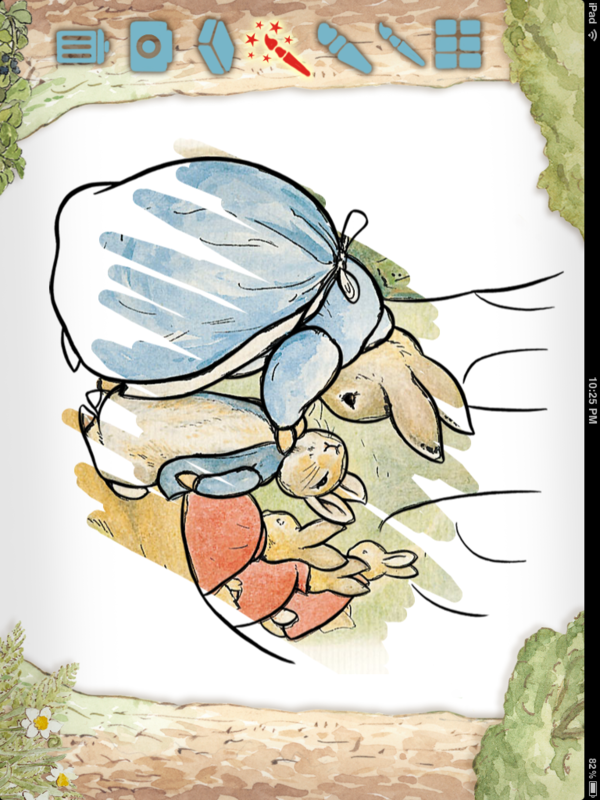 The last Peter Rabbit app is the one from the Official Peter Rabbit Site. It also tells the story. It has some neat features as well. There are some fun games and pictures to colour. 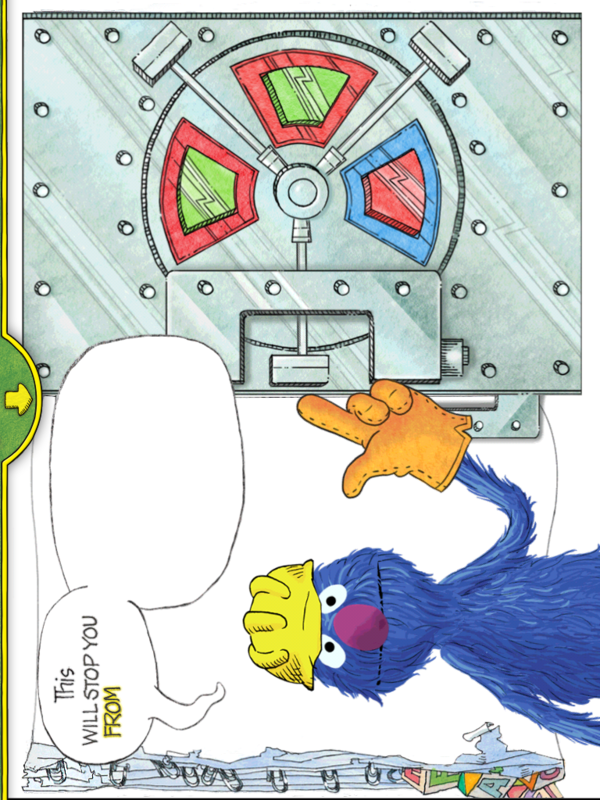 I liked the coloring one where you could use the magic pencil that colored the picture the same as the book. The games are cute too. I suspect that all three apps will be popular picks. I would find it really hard to choose between them. I like them all too!